As it happened - Eels 25 def. Dragons 12. 51. We're underway at Kogarah. Hindmarsh gets up gingerly after first hitup. Gloroius conditions. 4:13 PM Sep 13th from mobile web 50. Soward's first kick is out on the full. Went for cross kick to Sailor but 5m too long. 4:14 PM Sep 13th from mobile web 49. Correction on Eels lineup. Johnathan Wright not Broderick is in for Inu. Blame NRL Stats for that one. 4:16 PM Sep 13th from mobile web 48. Wendell tries to sell a knock on as a knock back for Scott try, celebrates like a pork chop before ref tells him its a changeover not a try. 4:18 PM Sep 13th from mobile web 47. Lots of quality field position for Dragons early. Camped in Eels half. 4:18 PM Sep 13th from mobile web 46. Reddy saves a try with a great tackle on Cooper. Hornby then kicks the ball dead in goal on the full from 15m out. 4:21 PM Sep 13th from mobile web 45. Parramatta in survival mode with ball at the moment. Dragons need some points from this glut of field position. about 24 hours ago from mobile web 44. Off a Soward bust, Cooper can't put Morris in for the opening try. Missed opportunity... There's been a few now. about 24 hours ago from mobile web 43. Soward takes an easy penalty goal after 15 minutes. But only 2 points from this run of pressure is a poor return. STI 2-0. about 24 hours ago from mobile web 42. First penalty for Parramatta after 18 minutes and they get the ball in the Dragons half finally. about 24 hours ago from mobile web 41. Parra goes close through a Hayne to Grothe pass but the latter knocks on. about 24 hours ago from mobile web 40. Best kick of the afternoon by Soward. Grothe takes it but forced in goal by Morris. Repeat set for Dragons after 23mins. about 24 hours ago from mobile web 39. Reddy and Robson drag Morris over the left touchline with superb defence. about 24 hours ago from mobile web 38. TRY! Parra strike first through Burt. Hayne bomb caught by Mortimer and it deflects back to Burt who scores under the posts. PAR 6-2, 27mins about 24 hours ago from mobile web 37. Hayne almost goes length of the field but Boyd gets him. Mortimer scores at the end of the set! about 24 hours ago from mobile web 36. Mortimer beats Young easily one on one from 5m out. Soft soft soft, Burt goal, PAR 12-2 after 32 about 24 hours ago from mobile web 35. Dragons hit back! Cooper and Morris make the yards and Soward puts Dan Hunt over off the back of it. Soward converts. PAR 12-8 close to HT. about 24 hours ago from mobile web 34. QF4 HT: Parramatta 12 lead St.George-Illawarra 8. Best- Hayne, Soward, Robson, Reddy, Burt, Weyman, Creagh, Hindmarsh, Keating, Mortimer. about 23 hours ago from mobile web 33. Second half underway. Most of the ground now in shade. about 23 hours ago from mobile web 32. Up and down the field early in 2nd half until Hayne knocks on, chance here for Dragons. about 23 hours ago from mobile web 31. Last tackle play is barge by Justin Poore... Why exactly? about 23 hours ago from mobile web 30. Nathan Fien is doing far too much kicking. Hornby has disappeared and Soward out too wide. Still PAR 12-8 after 48mins. about 23 hours ago from mobile web 29. Morris forces ball inside own 20 and Boyd knocks on. Here's the Eels first chance... Then knocks on and gets penalised for back chat. about 23 hours ago from mobile web 28. Reddy knocked on btw. Dragons march down field. Mateo and MoiMoi coming into game now. about 23 hours ago from mobile web 27. MoiMoi instant impact but tries the Justin Poore last tackle option. Costigan knocks on just moments after coming on. Parra time to strike? about 23 hours ago from mobile web 26. Mortimer's knock on could be crucial. Parra need to get 8 or 10 ahead before the Dragons get back on the board. 55th min. about 23 hours ago from mobile web 25. Parra look the better, more adventurous team with 23 mins left. about 23 hours ago from mobile web 24. MoiMoi instant impact but tries the Justin Poore last tackle option. Costigan knocks on just moments after coming on. Parra time to strike? about 23 hours ago from mobile web 23. Well... Fien can kick after all. Massive 40/20. Dragons need something out of this. about 23 hours ago from mobile web 22. Right call by ref Maxwell. Creagh does knock on before Cooper grabs ball to score. 20 mins left, Still PAR 12-8. Now Kingston loses it... about 23 hours ago from mobile web 21. Grothe intercept! 90m run off Soward pass! about 23 hours ago from mobile web 20. TRY TRY TRY! All of Manly cries out in pain, most of Kogarah not feeling much better. That was a try to Saints if Grothe doesn't get there. about 23 hours ago from mobile web 19. Burt converts Grothe try. PAR 18-8 with 17 to go. about 23 hours ago from mobile web 18. Grothe's put down was risky but Soward's chase was ordinary. He has to put in all the way since he passed it. about 23 hours ago from mobile web 17. Scott pushes pass but Soward can't hold it near halfway. Parra needs to set the pace now. about 23 hours ago from mobile web 15. Was Hornby in the air when Hayne hit him? Yes, another good call by refs. about 23 hours ago from mobile web 14. Here's the Dragons chance... And Hayne defuses Soward bomb under pressure from Creagh. Big catch. about 23 hours ago from mobile web 13. Parra give Saints another opening, forced Mateo offload... about 23 hours ago from mobile web 12. If I seem excited it is because of the quality of the game. I am not and will never be a Parra fan. about 23 hours ago from mobile web 11. Morris is IN! about 23 hours ago from mobile web 10. Boyd finds Morris with fine cut out pass. Soward needs to convert this. PAR 18-12. No good on kick. about 23 hours ago from mobile web 9. 18,174 at Kogarah. Mateo hooked. Dragons have 8 minutes to level this up. about 23 hours ago from mobile web 8. The field goal call goes up. about 23 hours ago from mobile web 7. Jarryd Hayne is awesome Gus. about 23 hours ago from mobile web 6. Booyah! Burt sends it through from 40ish metres out. PAR 19-12. about 23 hours ago from mobile web 5. Dragons kick out on full. Burt will go for goal? No he won't. 3 mins left in Manly's season. about 23 hours ago from mobile web 4. Hayne may have done another sensational thing but there could be obstruction. about 23 hours ago from mobile web 3. TRY and that's it for Manly for 2009. about 23 hours ago from mobile web 2. Hayne beat all 3 Dragons grades on that run. Burt converts, PAR 25-12 and that'll be all she wrote. Great Game. about 23 hours ago from mobile web 1. QF4 Final Score: Parramatta 25 def. Dragons 12. Best- Hayne, Hindmarsh, Grothe, Reddy, Robson, Burt, MoiMoi and Cayless. Congrats Parra, wow! 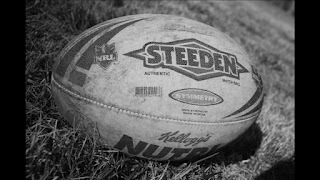 about 23 hours ago from mobile web ===================================================================== Final Score 4th Qualifying Final 2009 PARRAMATTA EELS 25 Tries: L Burt, D Mortimer, E Grothe, J Hayne. Goals: L Burt 4/4. L Burt 1 Field Goal. Defeated ST.GEORGE-ILLAWARRA DRAGONS 12 Tries: D Hunt, B Morris. Goals: J Soward 2/3. @ WIN Jubilee Stadium, Sydney. Sunday 13 September 2009. Official Man of the Match: Jarryd Hayne, Eels. NSC Man of the Match: Jarryd Hayne, Eels. Glenn Lazarus Player of the Finals Points: 5 - Jarryd Hayne, Eels. 2 - Nathan Hindmarsh, Eels. 1 - Eric Grothe Jr, Eels. Game Rating: 4 out of 5. One Line Game Review: How about that Jarryd Hayne? Parramatta proved they just wanted it more and defended brilliantly - thoroughly deserve to play in Week 2. ===================================================================== What the result means? St.George-Illawarra were Minor Premiers so they aren't knocked out. They do however have to travel to Brisbane to take on the Broncos in an Elimination Final on Saturday Night, while the victorious Eels will 'host' the Gold Coast Titans at the SFS on Friday Night. The Eels win means that Manly were eliminated from the competition. Below is the Qualifying Finals Review & first look at the Elimination Finals Matchups Video.